Band line-up during their last tour of Poland in 1973. Notice Bismarck's pronounced moustache and Wagner's foot left of the middle. 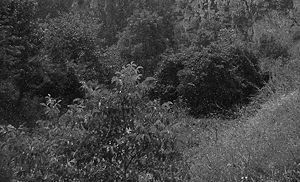 Collapsing New Buildings, originally worded Einstürzende Neubauten in the German language, are an elite mock band from Germany. Founded ca. 1960, they have brought fame and freedom to masses of devoted fans around Europe and central Asia. Their style of music ranges from randomly hitting the bathtub with a mallet to recording confessions of devoted perverted churchgoers to revolutionary reggae with elements of jazz-metal and techno-polka. They have so far released five CD's of their music as well as one compilation album and one live recording. Touring France all by himself in expectance of a revolution and some success of his classical music, Ludwig van Beethoven stumbled upon something soft and pink. He had picked it up and realised, it was a book of poems by anonymous authors. In him sparked the idea to write music to accompany those texts, music that would reflect the vibrations in his soul caused by the words. Upon arriving at home in his Berlin, he had promptly started collecting any and all available musical instruments. He got out all his pots, pans, spoons, empty bottles, dog, servant, dishes, as well as all electrical appliances [beforehand carefully smashed so as not to function properly but rather produce noise], and parts of his herd of children. So, on the 30th of January, 1961, the famous first rehearsal of the new band took place. The Beethovens rattled and hummed for over five hours, until three people fell unconscious and the police joined in with their sirens and gunshots. For Beethoven, however, this was a success. He immediately informed the media of his deafness and that he was backing out of public life. However, in reality, this had proved not to be the case. Beethoven had changed his appearance, cut his hair, grown a moustache and lost 1/3 of his imposing belly not to be recognised in the public. Thus prepared, he had gone on a headhunting journey through Germany to find fellow musicians. Beethoven's role in the band were his instruments of noise brought from home. Thus the band was formed. The name of the band was thought up quite promptly during the siege of Paris, as the demolition of the city centre looked interesting to the great musicians. Censored cover for the debut album. Success came in an instant. The new musical genre, which Bismarck himself described as being 'clarity and harmony, found otherwise only in international politics and the intricacies of religion', gained much attention. The group set out to record immediately. As studio, the Krupp steel factory in Cologne was chosen, so as to provide a good atmosphere. 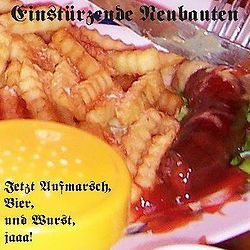 The first album, entitled Jetzt Aufmarsch, Bier und Wurst, jaaa! [in English: Come on home my sweet Heidi. ], went triple platinum in just four months. The European Union, after a debate, rejected the motion for the title track to replace Beethoven's Ode to joy as european anthem. 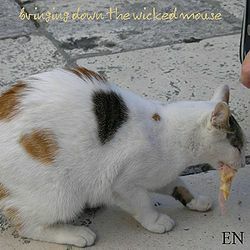 Cover art for the second album, Bringing down the wicked mouse. A world tour followed in 1963-1965, at which time also the two follow-up albums were recorded. The group filled stadiums and beaches, prisons and parking lots. In 1964, Benedict XVI came up with the band gimmick to dress in monk or priest robes. The next tour, this time of Africa, brought forth the live album Ich zerstöre deine Hütte und melke deine Kinder [English: Consuming the almighty river-serpent, live], which included the record-breaking cover of Wagner's Ring of the Nibelung played on harmonica, pan pipes and involving crowd chants. But the good times couldn't last forever. Peter Rammstein wanted to pursuit a solo career as a Nazi revolutionist, and Der Kaiser was dying of endless theological discussions with Benedict XVI. So, the band decided to record one final album and end the band career. As Berlin was, at that time, the largest construction site available, members of the band arranged, as per their bandname, to collapse everything. These sounds - setting up explosives, the blasts and the aftermath - were recorded, with live accompaniament of the band singing a capella. The resulting album was entitled Strategies against architecture. 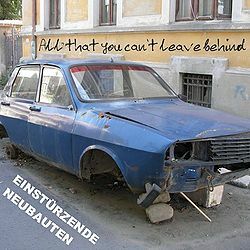 The best of Einstürzende Neubauten, entitled All that you can't leave behind. The group disbanded in winter of 1977, but not before releasing one more album with the original lineup, titled Stealing the Last Dance, which was a more disco-flavored album. Apparently, the band members wanted to bring the band back temporarily in order to cash in on the disco trend like everybody else. A compilation album with their best works was released the same year, combining the most classical early works with their best performances of the entire career. The next year, 1978, a solo album by Beethoven and Wagner was released, under the band name. The album is a recording of approximately 45 minutes of the two pondering the band's past in thought, smoking and drinking green tea. This was the last album ever to be released under the label Einstürzende Neubauten. Today, classical remastered albums are available from most downtown drugstores and are considered a great way of speeding up divorce.